A Houston father has been charged with manslaughter after he crashed, killing his 8-year-old son. Sheriff Ed Gonzalez originally said Fernando Carmaco was was suspected of intoxication and would be charged with murder. The sheriff's office issued a correction Thursday saying his blood level was "well below the legal limit." HOUSTON — A Houston father has been charged with manslaughter and aggravated assault after he crashed, killing his 8-year-old son and critically injuring his 5 year old. Neither child was wearing a seatbelt, according to HCSO investigators. In an initial tweeted statement, Sheriff Ed Gonzalez incorrectly said Fernando Carmaco was suspected of intoxication and would be charged with murder. The sheriff's office issued a correction Thursday saying his blood level was "well below the legal limit." "Previous information at the scene of the crash erroneously stated that Carcamo was intoxicated," the updated HCSO press release stated. "Investigators now believe the signs and symptoms of impairment were related to medication given to him on scene by EMS personnel." 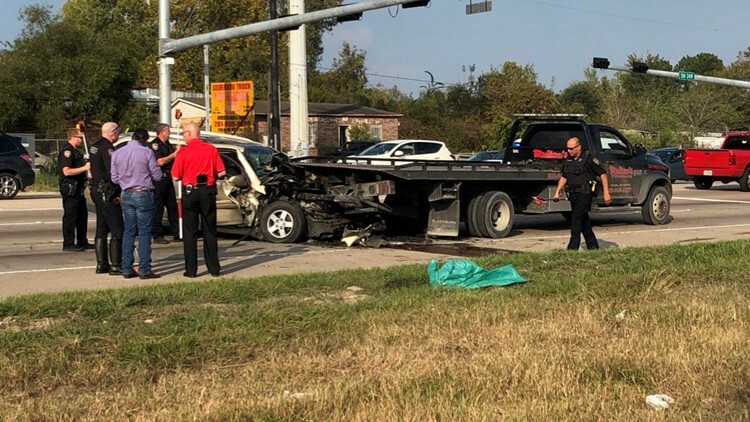 Crash investigators say Carmaco, 30, was speeding when he slammed into a wrecker stopped at a red light in the 2400 block of West Mount Houston. He then spun around and crashed into the back of tow truck. Eight-year-old Kristopher and 5-year-old Jacob were still wearing backpacks when first responders found them. They believe the father had just picked them up from school. "It just boggles my mind how somebody could be so irresponsible, to not only put themselves at risk but the greater public and two children, as well," said Sheriff Ed Gonzalez. "Seeing the backpacks still attached to their bodies, coming from school. An entire life before them cut short because of the irresponsible behavior of somebody who is supposed to be caring for them and protecting them. It's just inexcusable." Carmaco was also rushed to the hospital in critical condition. He's expected to survive.